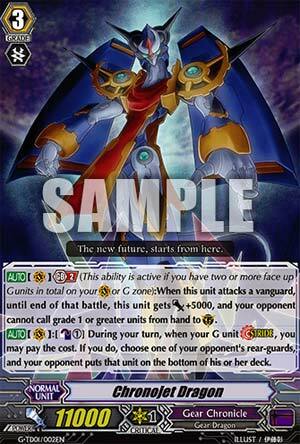 [AUTO](VC) Generation Break 2 (This ability is active if you have two or more face up G units in total on your (VC) or G zone):When this unit attacks a vanguard, until end of that battle, this unit gets [Power]+5000, and your opponent cannot call grade 1 or greater units from hand to (GC). [AUTO](VC):[Counter Blast (1)] During your turn, when your G unit Stride, you may pay the cost. If you do, choose one of your opponent's rear-guards, and your opponent puts that unit on the bottom of his or her deck. So we got the Trial Decks last Friday and so now is a good time as any to get in some opinions on this new stuff. And so we start with Gear Chronicle's main Ride priority, Chronojet Dragon. He has an unusual ability called Generation Break, which can't be used until you have the right amount of G-Units on your field or G-Zone face-up. In Chronojet's case, 2 (though do note he won't get to use his skill as a Vanguard until your Stride unit vanishes, since G-Unit Vanguards do not inherit abilities from the heart). But anyway, once you've got 2 face-up G-Units, when Chronojet attacks, he gains 5k and the ability to block of Grade 1 or above guards from the hand. That's certainly not an unwelcome skill, but...two Strides before that even works? It's about as slow as a Limit Break if not slower, unless you waste a Ragnaclock Dragon gaining a Critical right off the bat, which isn't likely. So really, you want Chronojet for the second skill. Whenever you Stride on top of Chronojet, you Counterblast 1 to send an opposing rear-guard to the bottom of the deck. So for the cost of a Grade 3, you get a +1 and the power to gain good guard quality? Pretty solid stuff. And the best part is that at 2 copies, the average customer only needs 2 Trial Decks to have 4 of him. Chronojet's the VIP of the deck. If nothing else, he's your incentive to buy the thing in the first place. And it's Trial Deck week, folks! We're looking at the three main deck and G-Deck boss units of each trial deck, so six cards this week everyone. And to start things off, we're looking at the newest clan of Cray, the Gear Chronicle clan. The Gear Chronicles have unusual abilities to manipulate space and time, which is needed to fix the mess that Link Joker caused by bringing Maelstrom Reverse from the alternate future, not to mention the alternate timeline, which, despite the crisis there being resolved, hasn't gone away. On top of it, you still have units from the Present and the Past mixing and mingling together, so something needs to happen to fix it, which is why the Gear Chronicle clan has appeared now. Anyway, Chronojet Dragon here is a pretty solid unit. When you perform Stride, you can CB1 to do a brand new mechanic for Vanguard. Spinning. When you stride with Chronojet Dragon here, you get to spin one rear guard your opponent has to the bottom of their deck. Dang, that's really powerful, stronger than retire for sure, after all, it gets rid of a unit and, unlike retire, doesn't allow the unit to get re-used for Legion. Not quite as good as Locking a rear guard, but still really good. It's also what the Gear Chronicle clan does well, spinning that is. Wait, what's this? There's another skill? GB2? Well, I guess we now have a new mechanic here as well. To go with the Stride units, remember back in Harmonics Messiah and how the unit is face up? Well, that's because of the Generation Breaks. When you have two face-up Stride units, which includes both the Generation deck and the Vanguard circle, Chronojet here gets +5000 and the Glory Maelstrom skill. Sheesh, between CEO Yggy, Sin Buster and now this, I think we've got plenty of Glory clones running around, thank you very much. I'd like to say that it's not too bad, but the Glory skill *IS* the second strongest Vanguard-affecting skill in the game. Stun, of course, is the strongest. The only good thing is that it's a touch slow, seeing as you need to stride twice just to use it, and by that time the game is probably going to be over, since Stride units swing at the number of "perfect guard or no guard". Anyway, simply put, Chronojet Dragon is a staple for Gear Chronicle players from here on out. Speaking of Perfect Guards, if you didn't know, the trial decks all have two perfect guards in them.